Sugar free dried cranberries can be difficult to find. But, it’s easy to make them at home. Here’s how to make stevia sweetened dehydrated cranberries. 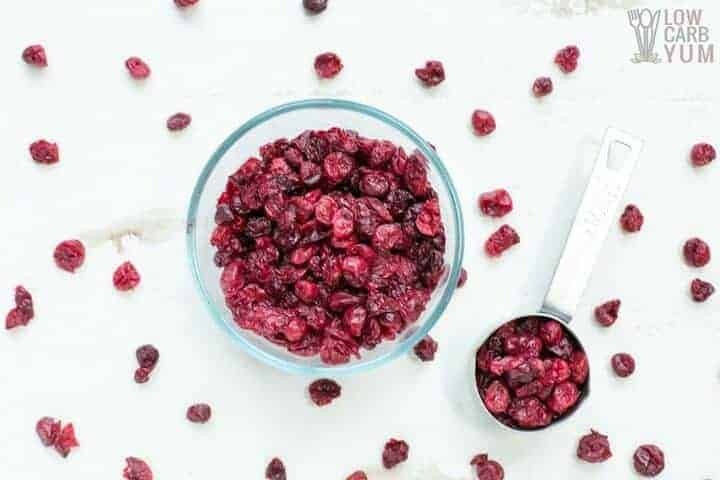 Since I pulled the big food dehydrator out of the pantry closet, I decided to try Laura Dolson’s recipe at about.com for sugar-free dried cranberries. I followed the recipe exactly as written. But, I think the cranberries may have been cooked too long as many stuck together like a bumpy fruit leather. It could have been because I used cranberries frozen from last season. They were softer than fresh ones would be. I could have just made unsweetened dried cranberries. However, I liked the idea of incorporating the sweetener into the berries by cooking them slightly in a little water. I used paper towels under the dehydrator screen on the tray to absorb the excess liquid while making the sugar free dried cranberries. There must be a different way to get the cranberries sweetened without adding so much liquid. Because the berries were so wet, it extended the drying time. I suppose the cranberries could have been drained or placed on an absorbent towel before drying. Next time, I may pop each cranberry with a toothpick or slice each in half and just soak it in the sweetener with a little water. I will definitely watch how long I cook them to make sure they do not get too mushy. Even though many of the cranberries were flat and melded together, I was able to break most apart after they were dried. They did not come out like store bought sugar free dried cranberries. 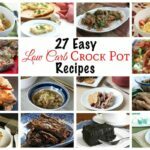 So, I’ll need to work on this recipe more. The finished product looked more like cranberry flakes versus dried berries. However, I used about a cup of the dried cranberries in a coconut almond cranberry trail mix. The sweetened fruit and nut mix is amazing and very addicting. 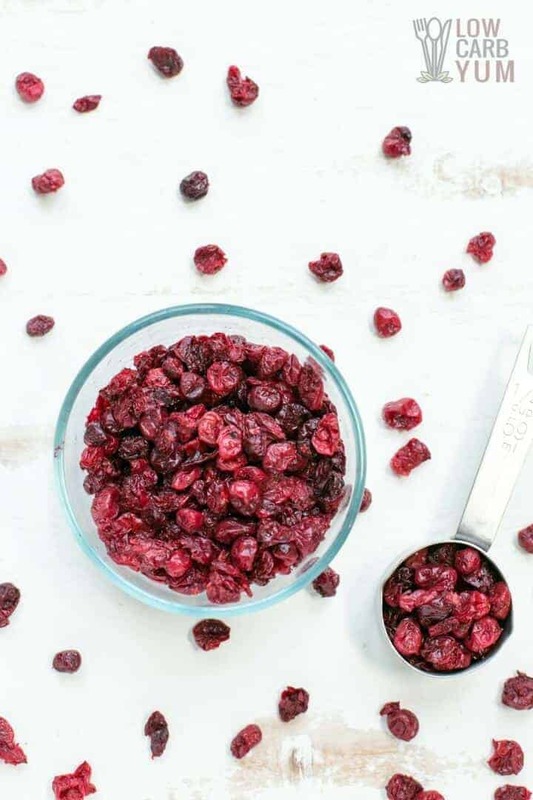 I’m sure there are tons of other recipes that these dried cranberries can be used in as well as just snacking on them or putting them on top of your salad. 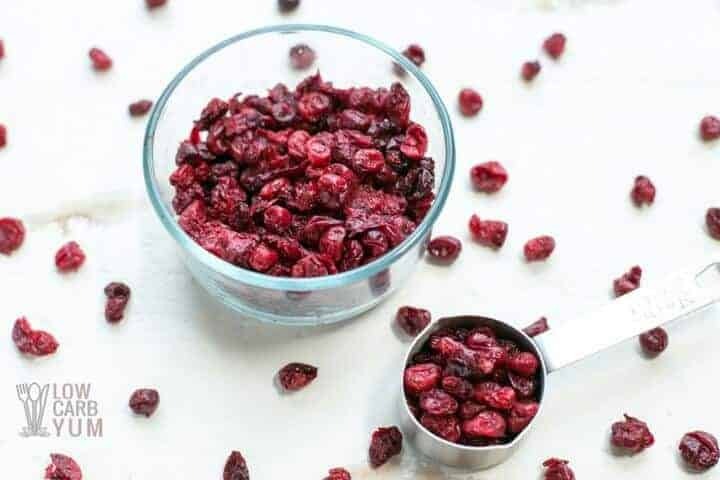 Dried cranberries without added sugar are hard to find so you'll want a recipe for homemade ones. 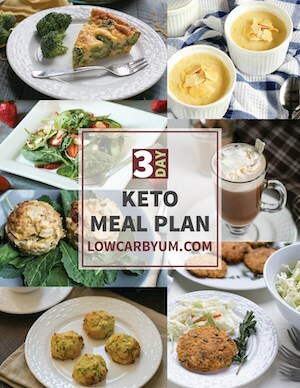 Here's the method I used to make low carb dehydrated cranberries. Put cranberries in a large skillet, and pick through to remove soft and/or brown ones. If sweetener is powdered, dissolve in water. Pour over cranberries and stir. Heat on medium high until cranberries pop, about 4-5 minutes. 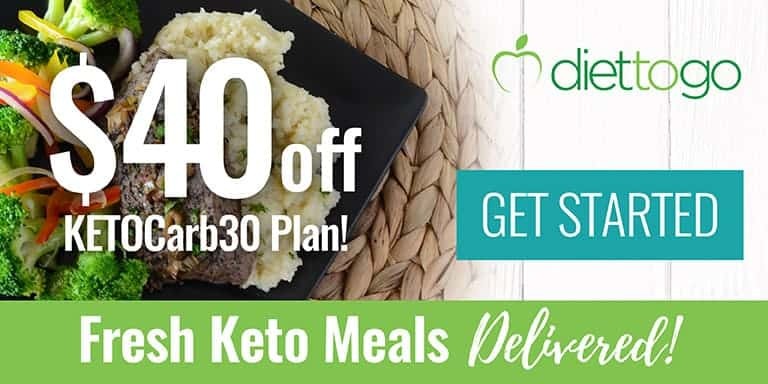 (May want to stop the cooking early and pop any additional with a toothpick). Stir every minute or two. When all seem popped, turn off the burner and let them cool for 10 minutes. Squish them down with the back of a large spoon. (I would use a toothpick or gentle pressure. You don’t want them to be too squished or they will meld together). Let cool another 5 minutes or so. Cover baking sheet with three layers of paper towels and a piece of parchment paper. (I used a few sheets of paper towels between the dehydrator tray screen and the tray). 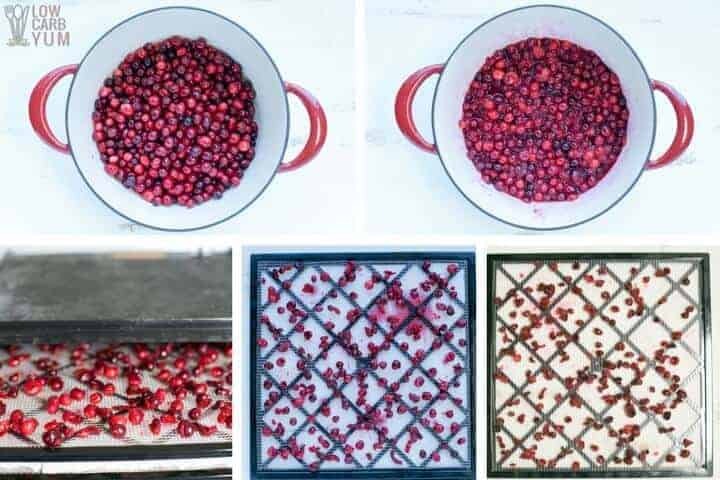 Spread cranberries on the parchment (or the dehydrator screen). They will mostly separate as they dry. If unpopped ones remain, pop them now with a toothpick or gentle pressure. Put in oven and turn heat down to 150 F (or use a dehydrator set at 145F). In 2-4 hours, replace parchment and flip paper towels over. 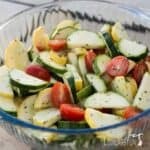 (If using a dehydrator can flip the paper towels or just remove them if most of the liquid is absorbed). Start checking after 6 hours. Total time depends upon humidity and other factors. It usually takes about 8 hours. 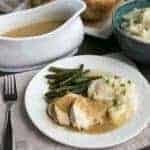 It also depends on whether you want to dry them to the point where they still have some “give” or whether you like them “crispier”. Separate them, and store in a covered container. Each 1/2 cup of raw cranberries contain 6 g carbs which is equal to about 1 serving dried. 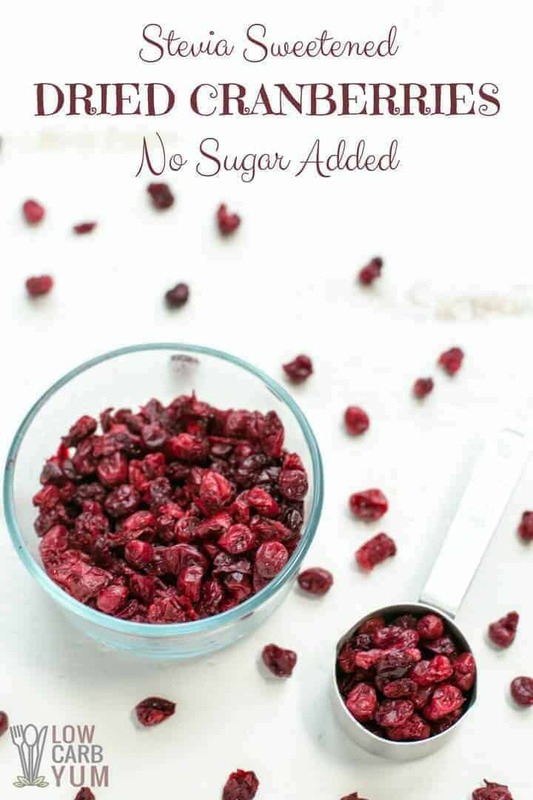 [post_content] => Dried cranberries without added sugar are hard to find so you'll want a recipe for homemade ones. 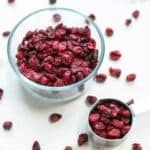 Here's the method I used to make low carb dehydrated cranberries.